I saw this inspiring Pin and I was off to the store not long after. There are times that Jambi likes to be wrapped up on the couch in a blanket and this looked great to her, so she was “all in”. She LOVES this thing. She will get out of bed in the morning and go seek it out before she gets dressed. So, it has been a great leg warmer! 1. 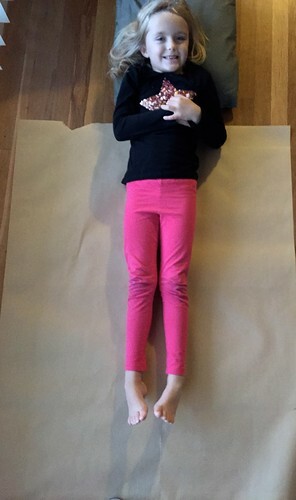 Make a template that you will use to cut the fleece – If you have a roll of paper that is the easy option. If you do not have access to a roll, you could use super cheap wrapping paper and turn it over to the white side. Another option is to take some sheets of newspaper and tape them together to make a sheet big enough. Or open up paper grocery bags and tape them together. The most important part of the design is the bottom fish-tail portion, so focus on getting enough paper for that at least. The “legs” portion of the tail is a long gentle curve and you can kind of wing it. I had access to my model, so I had her lie down on the paper. 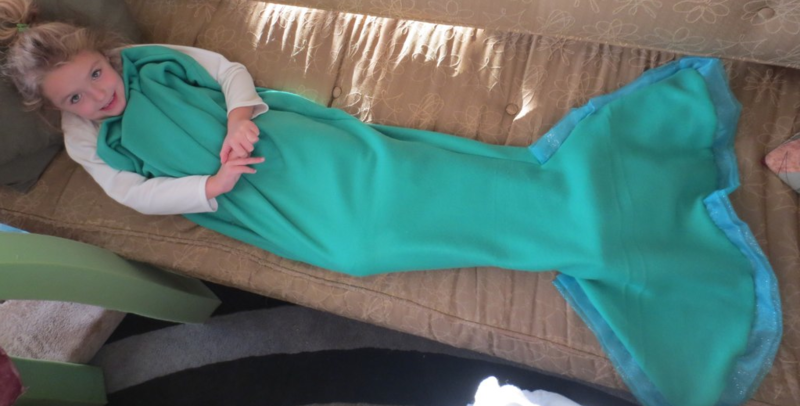 I was more concerned about where her feet were and the tail area than the waist portion, but you want to make sure it is wide enough for your mermaid to get into. Then I drew around her. Here you can see the pencil lines near her leg and part of the tail sketched out. To make sure that I got a symmetrical tail, I folded the paper in half (the long way) and I cut out two equal halves. 3. (This is otional) I wanted to add a little something extra to the tail, so I got two colors of shimmering chiffon fabric. I tore strips that were 4 inches and 5 inches wide, and folded them over to make layers. 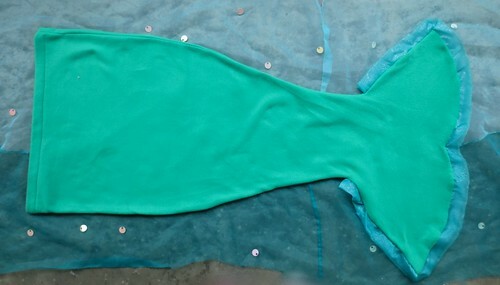 I pinned the two shimmering layers together and then pinned them into the edge of the tail. 4. Pin the fabric right-sides-facing together. 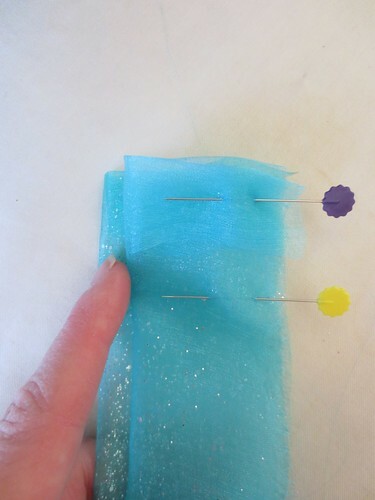 Remember to put the chiffon layers facing “inside” with the cut edges all lined up to sew. Then, when you turn the whole tail inside out, the ruffles will be on the outside along the edge. 5. Hem around the top opening and you are done. I MADE ONE OF THESE FOR THE SWIMMING POOL WITH SEQUINNED LYCRA FABRIC. 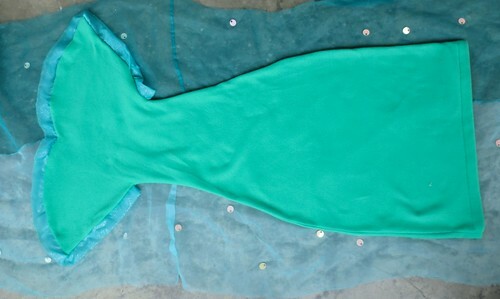 I BOUGHT A MERMAID PLASTIC SWIM TALE AND PLACED IT IN THE BOTTOM OF THE FABRIC ONCE I HAD TURNED IT RIGHT SIDE OUT. THE WHOLE THING CAME OUT WONDERFULLY AND MY TEN YEAR OLD GRANDDAUGHTER USED IT IN THE POOL AND THE BEACH ALL SUMMER. IT WAS A BIG HIT. 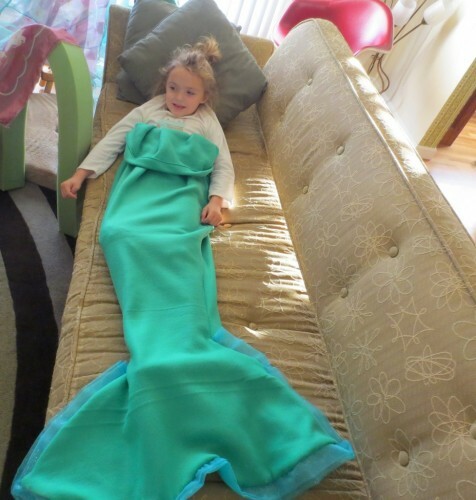 Well now, I HAVE to make this for my granddaughter! Thank you so much! I made this.I used pink fleese for a little ruffle. I also made a little one to match for a little doll. This is so cute and I’m excited to make it. Question – Is the stretch of the fleece horizontal (wide) or vertical (long)? Thanks for the help. Great question Betsy! In reality, it does not matter. We have done a LOT of these in the Stitch Lab now (with middle school girls) and they are all successful. If you lay out the fabric folded in half the way it comes off the bolt then the selvedges will be down the long side. That is how to start, regardless of the stretch. love this patterns. I’m inspired to make a couple of the grandkids..they would love this and would love to make one for the boy too.the shark pattern perhaps. I really want to make this for my granddaughter but I’m not quite understandin where you say fold the pattern in half and then you say fold the material in half,,can you please explain to me ???? Sue, Thanks for your question. I’m sorry if I was not clear. the first reference to “fold in half” is when you are making the pattern. 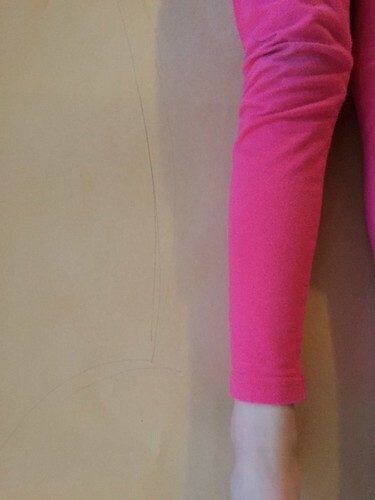 I traced around my daughter’s legs just to be sure she would fit in. Then, to make sure both sides of the tail were symmetrical, I folded the paper down the middle and cut both of the edges at the same time. Then you UNFOLD the paper and both halves are the same. Like if you cut a paper butterfly. 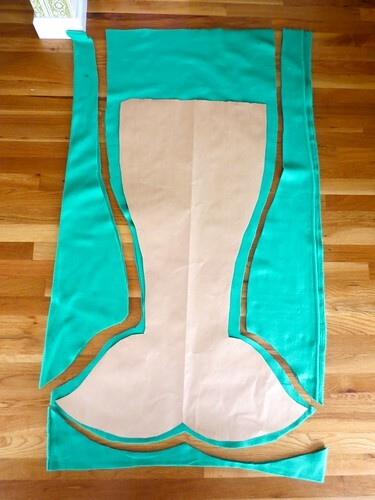 now it’s time to use the pattern (flat) to cut out the fabric. The tail has a front and a back side to it. Think of it like a sleeping bag. So you will need to fold the fleece in half the long way and “cut two”. It is almost redundant to say “fold the fabric” because it comes off the bolt this way. If you see the third picture up from the bottom you can see the craft paper pattern with a crease down the middle and it is on top of the doubled fabric that I just cut out.